Our Mission is to Bring About the Birth of your Book! Welcome to Bowman Publishing! As an independent publisher, our primary purpose is to provide an affordable and credible way for authors to share their writings with literally the whole world. Bowman Publishing is committed to ethical and wholesome standards in book production that bring your writings to life in a physical, beautiful, unique book. We are here to help you make your dream into reality. 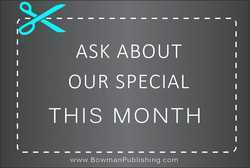 We're not just another "self-publishing" company - Bowman Publishing believes in serving you with personal one-on-one care to take your manuscript to an excellent high-quality physical published book. We are here to offer you the service of publishing your unique book at an affordable price. We have no hidden fees!